Starchitect Christian de Portzamparc designed the Fortress of Glassitude, aka 400 Park Avenue South, more than a decade ago in 2003. Now, the gleaming, shard-like tower is nearly complete, with tenants moving in and condo sales well underway, and at an event in the building this week, de Portzamparc expressed his pleasure with the final product. "It's good to see that something you did 12 years ago is still nice," he said, standing in one of the building's 23rd floor model units. The interiors were completely bare during a tour last fall, lacking even walls, and only renderings of the condos have been revealed, so this was the first look inside the finished apartments. The architect visited the building many times during construction, but he said, "It's amazing to see how it will be for inhabitants." During the years-long holding period between the initial design and construction, de Portzamparc said that the exterior of the building did not change, but the interiors were improved after Toll Brothers bought the site in 2011. Perhaps alluding to his other high-profile building in Manhattan, de Porzamparc said "It makes me happy that people will actually be living here," adding that an architect is "like a movie maker. How will be received by the people is important. You want people to like it." And it seems that the surrounding neighborhood loves the Fortress. The tower needed to go through a full Uniform Land Use Review Procedure in 2004 since it is taller than zoning allows, de Portzamparc recalls the community board being very enthusiastic about the tower. "They liked the design. They liked that it would improve this corner of the neighborhood." He spoke highly of former council member Margarita Lopez, who praised the design. "I hope she likes it now." The condos occupy the top 18 floors of the 40 story building, so the models are on one of the lower levels, but they still have great city views, including a few slices of the East River. "I designed it in such a way as to give the best views possibly from many different places," said de Portzamparc. All rooms feature floor-to-ceiling windows and interiors designed by Stephen Alton, who drew inspiration from the tower's angled facade. The model units were outfitted by Tamara Magel and Emily Santangelo curated the artwork. Kitchens feature white glass cabinetry and Miele appliances. The angled island is reminiscent of the building's facade. The model unit on the east side of the building has prime Empire State views. The dining room of this unit is located just to the left of the front door. The master suite in this unit, a three-bedroom, is enormous. The piece above the bed is by Orly Genger, who took over Madison Square Park in 2013. 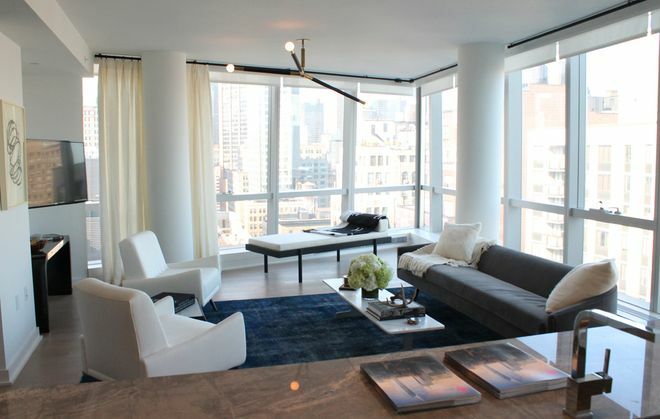 There are 29 pieces of artwork worth a total of $250,000 hanging in the two model units. The master suite has a separate office. The 81 condos are currently 50 percent sold. Sale reps say there has been a wide range of buyers, and they have sold some of every unit type, save for a four-bedroom, of which there are only two. There are a lot of "end users," i.e. people buying the apartments to live in, but there are quite a few pied-a-terre buyers, as well as parents buying for kids who are students. About 20 percent of the buyers have been international, coming from Argentina, Belgium, England, Korea, Mexico, and more. The amenity space, located below the building, is shared by the tenants and condo owners, and was completely finished by the time the first tenants moved in last winter.